An introduction to the plagues of Revelation chapter 16 is given in the preceding chapter. We are told that the seven last plagues have something to do with God's wrath which is explored in many places on this site. Let's now begin a verse-by-verse study of the plagues. Where are the Vials Poured Out? In the case of the first plague, it could be understood that the vial actually contains sores because when it is poured out "there fell a noisome and grievous sore upon the men." But the rest of the plagues don't read that way. In the case of the fourth plague, this looks like a contradiction. Verse 1 says that the vials are poured upon the earth and verse 8 says the fourth vial is poured upon the sun. This can be understood by looking at the word "earth" in the phrase "upon the earth" in verse 1. It is translated from the Greek word "ge" which is also translated "world" in Rev 13:3 - "... all the world (ge) wondered after the beast." Of course, it is not the world as in the planet that is wondering after the beast but, rather, the people of the world. A similar understanding can be seen in many parables where "earth" represents the people of the earth. 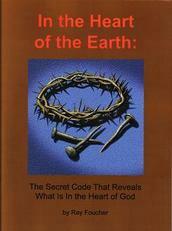 And this, of course, is very key to the understanding of that phrase "in the heart of the earth" connected to the resurrection that I speak of in my book In the Heart of the Earth: The Secret Code That Reveals What Is In the Heart of God. So, really, the plagues are poured out upon the people of the earth. It is the people that feel the effects. It is the people who have rejected God. It is the people of the earth that God longs to have turn back to Him and trust Him. What Do the Vials Actually Contain? 1 sores Do sores attach themselves to a person? The plagues will literally happen but we need to recognize that there is much symbolism involved. The way it is written is that the contents of each vial are poured out - and they all contain the same thing - but then various things happen. So the question is still what do the vials contain? Scripture says they contain "the wrath of God" and this wrath is explained in Romans 1 and other places. Men moved further from God's will and, in reaction, He "gave them up" (Rom 1:24, 26) and "gave them over" (Rom 1:28), allowing them to do what they wanted - they then reaped the consequences. The wrath of God being poured out is Him taking, as it were, another step away from man. He withdraws His presence and protection yet more and the result that follows is further destruction. there followed ..." there fell ..."
What followed in each case was a destructive event. Remember who the destroyer is. Another way to look at this is to ask if the sun or the Euphrates River are being, somehow, punished by God? Nature will surely feel the effects of the plagues but they are poured out because of the actions of men. Further evidence that the vials are symbolic is that back in chapter 5, the 24 elders are described as having vials (the same original word) full of the prayers of the saints. The vials do not seem to include physical things; rather it is a way of describing something about our relationship to God - either our prayers going to Him or His stepping back and allowing us to have our own way. The words "noisome" and "grievous" are both most often translated as "evil." The Greek word translated as "grievous" is from a word associated with pain. In spite of all his losses and the pain he was in, Job was proven to be faithful to God. We will see that the plagues will confirm the attitude of men who have refused God's mercy. The plagues can be considered as being consequences of man's actions or choices. If men chose Satan as their master, they will feel the effects (reap the consequences) of that choice. When Satan afflicted Job with sores it was not because of Job's choices but, as the story shows us, it was a special situation allowed by God to prove Satan's position to be wrong. Satan's stated objective was to get Job to blame God. He will have the same objective at the end only then he will, as this chapter of Revelation shows, be largely successful. We will see in Revelation 18 that the sea is very important for the commercial trade by which some men were made rich largely at the expense of others. The sea and other water sources will be affected to the point that nothing can live in them. This may well be due to the effects of pollution. "As the blood of a dead man" may be a reference to such blood losing it oxygen-carrying capacity and therefore its ability to sustain life. There are already vast areas of ocean that are affected like this. The changelessness of God is emphasized in light of the great changes taking place on planet Earth. God is seen to be just in allowing the plagues. This plague is seen as appropriate in light of the actions taken against God's people. The altar here would be the altar of incense in the heavenly sanctuary. The altar of sacrifice is never mentioned as being in heaven. There is good evidence that the altar of sacrifice of the heavenly sanctuary system is actually the earth itself and, more specifically, the cross of Calvary. Why does it say that the fourth vial is poured out on the sun when verse 1 says that the plagues are poured out on the earth? Again, the plagues are poured out primarily on the people of the earth. It is people who have rejected God. It is people who God has been trying to reach all this time and who God finally abandons to the results of their free-will choices. "Power was given" can be rendered "it was given" or "it was permitted." The power of the sun to scorch which was previously held back is now released. What does it mean for the sun to have power to scorch mean with great heat? Well, we know that the sun undoubtedly has great heat. As we approach (it is now June 2013) the next solar maximum in the sun's 11-year cycle we are likely to see more significant effects from solar flares and other sun activity. Read more about that here. The description of this plague is given in terms of what the sun has power to do but the damage could come to a large degree from the decreased ability of earth's atmosphere to protect us from the sun's damaging rays. And this could easily be a consequence of men's actions as man has been messing with the climate in various ways. Why does the verse say "blasphemed the name of God"? rather than just "blasphemed God"? In verse 11, we will read "blasphemed the God of heaven." Is there a difference between blaspheming God and blaspheming the name of God? What is the name of God? Do most people even know what it is? What would it mean for the name of God to be blasphemed or "evil spoken of" because of someone else? - because of their actions. In this verse, Paul is warning against the possibility that the "word of God" might be blasphemed as a result of improper conduct. We can see more evidence that name is referring to character when we look at what it means to do the opposite of blaspheming God. Don't you think this is referring to the honor of His name, His reputation? What does good to or for His name is the righteousness (the righteous life) of the one being led. He helps His followers to do right so that people can see how good He is. God's plan was to bless Israel that by their holy lives they could show what a wonderful God He is and thus attract other nations to follow His ways that He might bless them also. The word "gnawed" is from the Greek "massaomai" which is only used once. Think of "masticate." Strong's meaning is given as "to chew, consume, eat, devour." Could it be related to the idiom to "eat your words" which means to admit that what you said is wrong? If you eat your words, you accept publicly that you were wrong about something you said. Whether they will admit it or not, the words of the beast kingdom will, in teh end, be proven to be false. "Lord, make my words as sweet as honey ... for tomorrow I may have to eat them." They are blaming God for their pain which, no doubt, includes both physical and mental. Evidently, they are blaming God for their state. In that state of mind they are hardly likely to repent and turn to Him. Thus they are confirmed in their attitude toward Him. Historically, there was an event that involved the drying up of the River Euphrates. Cyrus (a king from the east relative to Babylon) was the founder and king of the Persian Empire. He led the armies of Persia in an attack on the city of Babylon around 539 BC. The city was so well fortified that its only weak point was where the Euphrates River flowed under the wall. The waters that flowed through Babylon were literally dried up when Cyrus had his soldiers dig channels to divert the water of the river away from the city and enter the city via the dry riverbed. The resulting fall of Babylon lead to God's people being able to return to the Promised Land. So the waters of the symbolic Euphrates River could represent people who support the modern, symbolic Babylonian system. In chapter 9, we looked at how even the word Hebrew can refer to the Euphrates River marking a division between God's people and the wicked. How could the sixth plague, the end-time drying up of the Euphrates River be seen as a consequence of man's actions? We will discuss that more when we get to Revelation 17. People are being deceived and will turn against their teachers who have been telling them lies. Think of the false teaching of the secret rapture. Many people do not even concern themselves with end-time events because they have the false hope that they will be taken to heaven before the really serious trouble breaks out on planet Earth. The kings of the east could even be a reference to Jesus and the angels who come with Him at the Second Coming which occurs from the east to the west. The Beast is the papacy as shown in chapter 13. The false prophet is apostate Protestantism also explained in the study of chapter 13. This is an interesting analogy in light of how frogs catch their prey - with their tongues. The tongue can also be an instrument of deceit and it is largely by deception that people are caught in the snare. We are going to see great miracles in coming years. Many will be deceived by them because they are not familiar with the word of God. Before getting into where they are gathered for the battle, we are given an admonition to do something as the time approaches. To keep your garments is to not let them become defiled by sins. There may be an allusion here to the Roman army's practice of stripping the garments from soldiers who fell asleep on duty and sending them from their post of duty naked. If they watched diligently they could keep their garments. The word "he" is better translated as "they" as is done in many versions. "They" would refer to the dragon. The beast and the false prophet who through their deceptions have gotten most of the world to go along with their false system. So virtually the whole world will be gathered because they were convinced by miracles rather than by the word of God; gathered not so much to a physical place as to agreement. Where is death? Death is not a place. Everyone dies somewhere. God's people will also be gathered but into the wilderness (Rev 12:14). While they will very likely be in literal wilderness areas to escape the enforcement of the mark of the beast, a wilderness situation is also a reference to divine protection. Thus, it is also referring to more of a situation than a single, literal geographic location. There is no physical location that has ever had this name. "Armageddon" is transliterated from the Hebrew, as John mentions; actually from a combination of two words. The first word could mean "city" or, more likely, "mountain." The second is commonly thought to be "Megiddo" which is identified with the ancient city of Megiddo. Another theory is that "-meggedon" is from "moed" the Hebrew word commonly used in the Old Testament for congregation, for an appointed feast and for an assembly. There is no mention in verse 16 of a war or fighting. The "battle" in v 14 is from the Greek word "polemos" which is the same word used in Rev 12:7 ("there was war in heaven"). It is where we get the English word "polemic" which refers to a dispute, strife or a quarrel. While verses 15-21 of this chapter are regarded as a description of the Second Coming, the actual Second Coming is not mentioned. However, the words spoken by the great voice out of the temple of heaven from the throne are very significant: "it is done." It seems this marks the end of the great controversy. "It is done" every decision is made. Where else is this said? Jesus, at this point, had gained the victory and was actually quoting from a Psalm which describes His experience on the cross. The "he hath done this," equivalent to "it is finished," is marking an important point in salvation history. It is also spoken in Revelation 21:6 after the creation of the new earth when all is restored and sin and sinners are no more. What will this great earthquake register on the Richter scale? Its effects are further described in the next two verses. The great city must be Babylon from the context; the second part of the verse. Babylon is often referred to as "that great city" – We will cover it more in chapter 18 where the great city is mentioned five times and is definitely identified as Babylon. The Bible makes a point of emphasizing that after the fall of the literal city of Babylon centuries ago it would never again be a great city. Since the references in Revelation very clearly are not referring to the literal city of Babylon they must be referring to Babylon in a figurative sense. In that sense, Babylon still exists and will thrive in the future. Babylon, if its origin is examined really refers to confusion and, in a spiritual sense, that is exactly what it is. The "cities of the nations" where nations (Greek: "ethnos") is most often translated as "Gentiles" is referring to the cities of people not following God. Or is it cities other than Jerusalem or others in Israel? We will have to explore this further. The city being divided into three parts could be a reference to the end-time system of Babylon coming apart as the alliance of the three powers that support it - the dragon, the beast and the false prophet - comes apart prior to the Second Coming. "Every island fled away" seems to be associated with the great earthquake. Earthquakes have the potential to move land masses and this will be an earthquake such as has never been felt before. We could ask what does "every island" mean? I used to wonder about this when I first started studying prophecy and lived on Vancouver Island on Canada's west coast. Having studied oceanography, I could make the distinction between oceanic islands and continental islands. The Earth's crust in the oceans is composed of basalt and is 5-10 km thick. Earth's crust on the continents is composed of less dense granite and is 30-50 km thick. An "island" like Vancouver Island is actually part of the continent, attached to it and, in that sense, is distinct from oceanic islands. Oceanic islands are mostly formed from volcanic activity where magma from the earth's mantle comes through the thinner oceanic crust and builds a volcano which protrudes above sea level. Such is the case with the Hawaiian Islands. So does "every island fled away" mean that Vancouver Island will sink? Not necessarily, but - considering what is coming - that is not impossible. It seems that these statements are made right at the Second Coming. It is at this point that the mountains are moved leaving the wicked with no covering, with nothing to shield them from the face of the Savior. Here, "reserved" is not like kids stockpiling snowballs before the other side launches the next attack in a snowball fight. Rather, it is more like God is holding back the hail as long as He can to protect even His rebellious children. But God will not impose His presence or protection on those who want nothing to do with Him. The word "reserved" is more commonly translated and used in the sense of to "spare," "keep back," or withhold." When this hailstorm comes it will pulverize everything that has not already been destroyed. Estimates of the weight of a talent range from 26 to 36 kg (59 to 80 lb). That sounds pretty serious. People themselves have terrible sores. The state of people's health must be very poor by this point. Everything in the seas has died. The phytoplankton are responsible for producing much of the earth's oxygen supply. The food supply, cattle, crops will be very much affected. The sun has scorched people and would also have scorched crops, caused drought, and affected weather systems. The support for the beast system has dried up. The economy and infrastructure of the earth is in tatters. The earth has been ravaged by war quite likely involving nuclear weapons. The condition of people is described - 2 Tim 3 "For men shall be ..."
The islands and mountains have moved. This can only be associated with great destruction and lots of very violent earthquake activity. Very large hailstones pulverize what is left. And there are some people who want to stay here and spend 1000 years fixing up the earth! This comes from a misunderstanding of the millennium. Besides that there are verses that speak of the destruction of the earth and even the destruction of those responsible for destroying the earth. The phrase "without and void" is the same that is used in Genesis 1:2. The earth will have returned to the state it was in before creation week. We could look at it this way: just as God started with a world that was without form and void and created a perfect world in seven steps (7 days), so in seven steps God turns the world over to Satan and all will see that when Satan is unrestrained, when Satan is "in charge" perfect order is turned back into chaos. Also, note that, in the passage of Jeremiah above, it says that "there was no man." There will be no men living on earth during the millennium. The Earth will be waiting for its re-creation at the end of the 1000 years (Rev 21:1). With the trumpets, we noted that each trumpet would sound and be followed by something else. "One may ask: "why would a loving God allow such horrible suffering as that associated with the last plagues?" It will have the effect of showing to all intelligent beings the evilness of Satan's sinister doings which will, by contrast, vindicate the actions of God." With the plagues, each vial is poured out and then some disaster strikes the earth. It is not that the vials contain disasters. (The vials contain the wrath of God.) God's wrath needs to be properly understood. A vial being poured out is equivalent to God taking a further step away from man. It is interesting that vials are also spoken of as containing the prayers of the saints - Rev 5:8. In both cases, the vials contain not physical things but could they be describing something about man's relationship with God? There is surely much more to understand about God's part in the plagues.